ts from the classic traditional compact camper layout. The kitchen and storage are positioned down one side of the vehicle but it has an innovative modern twist with an extremely clever use of space and technology. There is more space and storage in the Birchover than in many larger compact campers. Extra storage is created through use of some unique ideas such as the barrel-fronted door that conceals the fridge and grill. This enables more storage and worktop space and when closed looks neat, stylish and sophisticated. The easy to use rock and roll bed with even more storage underneath is one of the widest available in a camper this size while also being perfectly at for an extremely comfortable nights sleep. 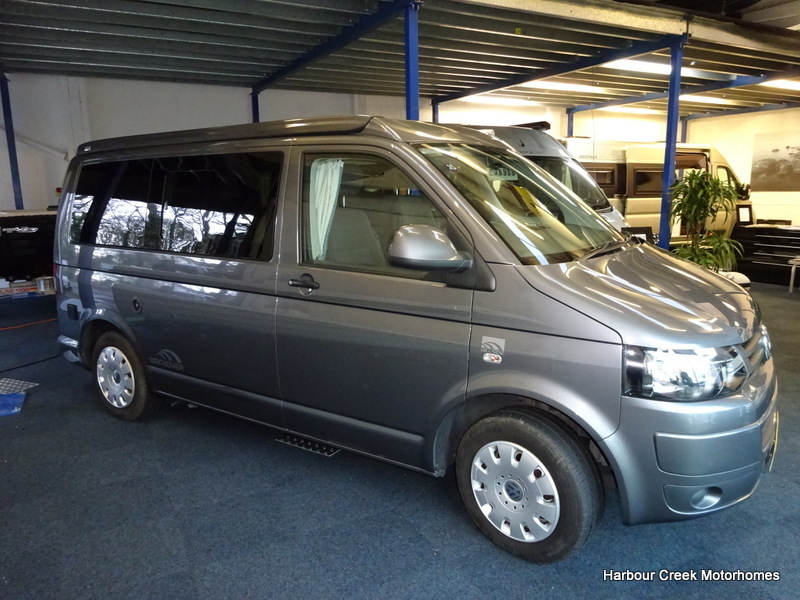 Finished in Metallic Grey, this Birchover comes with many extras including, Fiamma awning, Bike Rack, Eberspacher blown air heating, SCA 190 lifting roof, Air Con and Appearance pack.